Science is a part of our daily life from cooking, playing ball, growing a garden, technology and watching a rain storm. Kids need to enjoy science even if they do not become a career scientist, because it is important to enjoy the subject. Understanding science helps kids appreciate and relate to the world around them. Science education teaches children more than just geology, biology, or physics. They learn to make observations, collect data, think on their own, and draw conclusions. Without science we would not be able to predict the weather, earthquakes, cure illness or make products that enhance our lifestyles today. We need more scientists. Kids are naturally curious. Science education fuels that curiosity and provides kids with valuable ideas, skills, and potential future career choices. Science education gives kids the opportunity to experiment and work in teams increasing communication, research, reporting, and collaboration skills. Kids who have an understanding of science are more receptive to future technologies and ideas that can stimulate research and development. Geology education teaches kids about earthquakes, volcanoes, landslides, and tsunamis giving them knowledge that can protect their health and safety. Kids who know rocks and minerals can have many careers in gardening, groundwater recovery, pollution control, and jewelry making, just to name a few. 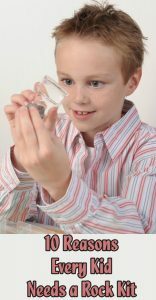 Rock kits help to engage children with a hands-on introduction to science when they are at a naturally curious age. Since you can keep your rock kit forever, kids can come back again and again to find new details about their rocks. Mini Me Geology has a large selection of rock and mineral kits, individual samples, fossils, books and accessories to help engage your kids in science. With STEM becoming a more important part of most school curriculums, finding fun and innovative ways to encourage children’s interest in science is important. If you have questions about how to use rock and mineral kits with your kids, contact us and we will be happy to help you find the perfect kit for your child’s age and interests.